Recommend this to anyone of any age. 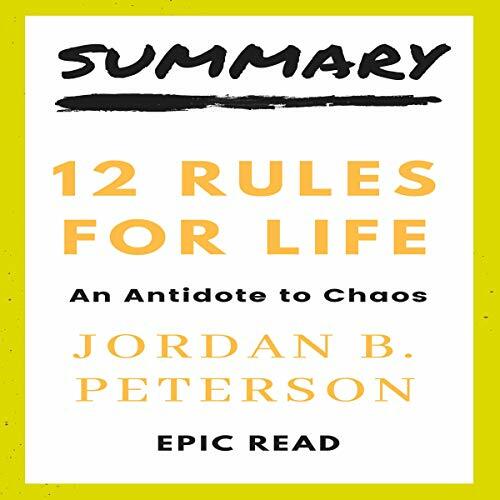 This audiobook contains a comprehensive, well-detailed summary and key takeaways of 12 Rules for Life: An Antidote to Chaos, by Jordan B. Peterson. 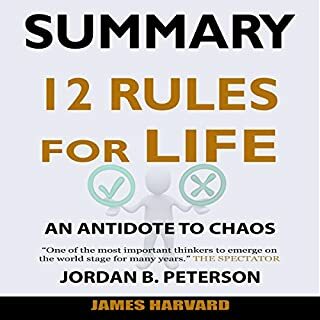 It summarizes the book in detail to help people effectively understand, articulate, and imbibe the original work by Peterson. This audiobook is not meant to replace the original book, but to serve as a companion to it. Summary of Feeling Good: by David D. Burns, M.D. >"Labeling yourself is not only self-defeating, it is irrational. Your self cannot be equated with any one thing you do. Your life is a complex and ever-changing flow of thoughts, emotions, and actions. To put it another way, you are more like a river than a statue." - David D. Burns, M.D. 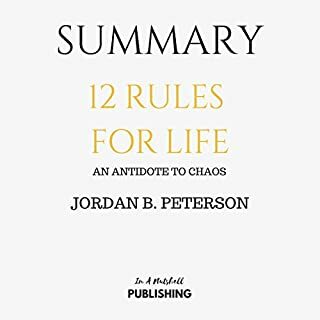 Important note: This is a book summary of 12 Rules for Life: An Antidote to Chaos by Jordan Peterson. This is not the original book. 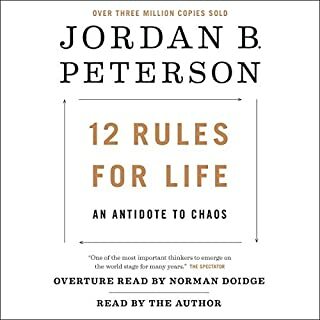 Jordan B. Peterson's 12 Rules for Life is thought-provoking in every sense of the word. The Canadian clinical psychologist puts forth his ideas about a Creator, personality, existence, the interconnectedness of order and chaos, the gender roles assignment discourse, and a variety of other controversial topics. It is refreshing, and sometimes confusing, how he weaves biblical accounts and characters into the telling of his stories. But what might raise the hairs the most are his views on political correctness regarding cultural appropriation, white-privilege, postmodernism, and everything in between. One thing is clear about Peterson. He is a man unapologetic of his views, which are largely unpopular, closely conservative, and politically incorrect. 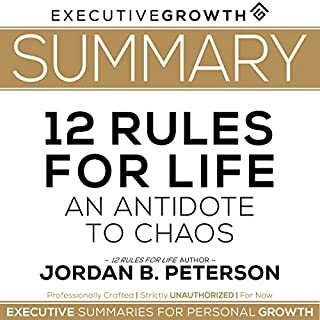 In this summary, I will walk you through all the ideas worth remembering from that book, as well as a detailed summary of every single chapter. A ton of value to your life. I don't think you can read this book and get nothing out of it. It is definitely worth a quick read if you are busy, but if you have the time, a thorough reading will net you a ton of value to your life. That is my favorite part about him. If you are a fan of Jordan Peterson, you will no doubt enjoy the book, but what if you aren't? I still say you will get a lot out of it. He has some extremely in depth insights and will make you really think. 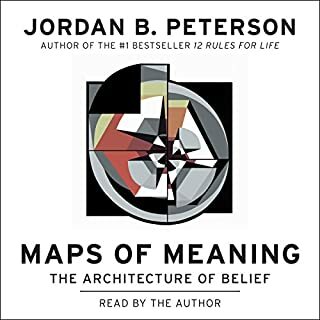 That is my favorite part about him and this book, it really required you to stop and think about things, and when you do you know a lot of what he is saying is correct on some deep levels. This book is impressive for me! Exceptionally supportive to the present living and traversing regular. Disorder is cherished by a few people and they want to compel it upon you also. This book is impressive for me! I found this book awesome for me. Helps to see the interaction between the rules and some high level interconnections. I found this book awesome for me and helpful indeed! This book give an extraordinary data. This book give an extraordinary presentation and contains heaps of data. It contains extraordinary learning and will condensed form of the book. I discovered this book extremely elegantly composed and simple to tune in. I truly delighted in listening this book and I profoundly prescribe this book to anybody intrigued! This book safeguarded some valuable data of life. This book safeguarded some valuable data of life. The creator shows tenets of getting achievement in your life.I prescribe this for youthful and old. It's a simple read and something you need to peruse and over once more. It is a decent and superb book for me. It is a decent and superb book for me. I discovered this extremely intriguing and accommodating. Still snared on this when I began to listen the whole book. Heaps of things can be gained from it. On the off chance that you need to wind up fruitful in the advanced life, at that point this guide is for you. The creator offers us the outline of 12 rules forever. I discovered this book extremely enlightening, viable, and helpful. All data is spread out in coherently and simple to understand.I observed this to be a diagram of the first book. It gave me enough data to choose in the event that I might want the book. It worked for me. Much obliged .. I adore the general substance of this book for giving me exercise that I can use with my regular day to day existence. You will have the capacity to enhance your self for a superior you so you can remain with your head up. This are only the tenets of life that actually you should pursue so you can have a superior and smoother life in front of you. Extraordinary synopsis, extremely supportive. It's so elusive time nowadays to get past a whole book, there is simply an excess of data out there.not every last bit of it merits our time. This outline Allred me to take in the key indicates and begin consolidate them into my reasoning. On the off chance that I discover them if esteem I can simply return and read the full book, realizing what it is I'm putting resources into. What's more, the synopsis makes it less demanding to prescribe to other people.